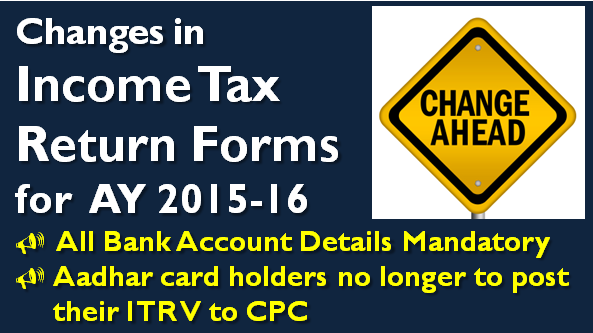 Recently Income Tax Department has issued new ITR forms for Assessment Year 2015-2016. These new forms are also available at efiling portal for Efiling Income Tax Returns. As the last dates for filing these forms are coming close, we have come with our Another list- 10 Changes in Income Tax Return for the Assessment Year 2015-2016. Most of us rely on Income Tax Return preparation Softwares to Efile Income Tax Returns. We feed the details and software provide us with the Computation, missing data and errors in our XML file and we finalize our Income Tax Return. But have we ever wondered, if the rules used by the software companies are not correct. What will happen then? The answer is coming to us regularly these days in the form of Notice of Defective returns under section 139(9) or wrong processing of the returns under section 143(1). To save oneself and clients we should always look the manual copy of return before efiling it and also try to read the XML file (if possible). Here we are giving 10 things that has changed in ITR this assessment year and we should check it before filing the Income Tax Returns. All of us know by now that Adhaar number is required from Assessment year 2015-2016 to be filled in the Income Tax Returns. It is not mandatory for those who are still not able to get it but for those who have, it is to be given in Income Tax Return. Are we doing it? Most of us will say yes and some would say no. But Adhaar is compulsory for those who have it and if your client or you have it, then it is better to provide that in the Income Tax Returns. Yes you read it correct. Passport number is also to be given if the same is allotted to the Assessee. As per the professional community Passport number are asked in Income Tax Returns, to make sure assesse returned income matches with its expenses on Foreign Travel and also Passport number will help to track Foreign Assets and Foreign Income of the Assessee. Another major change in the Income Tax return is to provide Bank Account number of all the Accounts in India whether Saving or Current. This will not include dormant accounts and also exmption has been given in revised forms from showing balance as on year end. In ITR 4, date of Formation of HUF is now specifically mentioned. Earlier this date was given in Date of Birth and was not a correct nomenclature but from Assessment year 2015-16 onwards date of formation of HUF is added in Income Tax return Form. "Board may, if it considers it desirable or expedient so to do for avoiding genuine hardship in any case or class of cases, by general or special order, authorise any income-tax authority, not being a Commissioner (Appeals) to admit an application or claim for any exemption, deduction, refund or any other relief under this Act after the expiry of the period specified by or under this Act for making such application or claim and deal with the same on merits in accordance with law"
This option has been added in the Form under"RETURN FILED" column, the return would be processed only after matching it with the relevant order. Details of Foreign Bank Accounts (Including Beneficial Interest) at any time in previous year.Details of Financial Interest in any Entity held (Including Beneficial Interest) at any time in previous year.Details of Immovable Property held (Including Beneficial Interest) at any time in previous year.Details of any other capital asset held (Including Beneficial Interest) at any time in previous year.Details of Account in which you are signing authority (Including Beneficial Interest) at any time in previous year and which is not included in 1 to4Details of Trust created under laws of a country outside India in which you are a trustee, beneficiary or settlorDetails of any other income derived from any source outside India which is not included in item 1 to 6 and in income from business and professionFurther in each point details like Country name, Name, Address, Amount, Date etc. is to be provided. In ITR 5 details regarding Remuneration paid or payable and Rate of Interest paid to partners are added. Detail of Member admitted and retired, their profit sharing ratio, name and date of admission/retirement is to be also quoted in the Income Tax Returns. In New ITR Forms Income which is exempt from Tax in the nature of Agriculture has to be given in details. Details such as Gross Agricultural Receipt, Expenses Incurred on Agricultural, Unabsorbed Agricultural losses has to be disclosed in Income Tax Return Forms. Section 54 allows investment of under utilized capital gain amount in Capital Gain Scheme. The sum deposited in Capital Gain Scheme is to be utilized within a period of 3 years from the date of the deposit. In case the amount is not utilized the same is taxed as Short Term Capital Gain/Long Term Capital Gain as per relevant section of Income Tax Act. The New Income Tax Return forms requires the disclosure of the amount not utilized in the Capital Gain scheme. The numbering of schedule has been changed. In new ITR forms rows and colums of Tax Payments, TDS and TCS has been given after Verification row and there after Schedules of Income Tax return are given.